'We have reached the distant horizon of an age of peace and prosperity!' When the TARDIS materialises on an alien planet, the Doctor insists that he and his companions have arrived in the far future. Steven and Dodo think otherwise, however, after they encounter a band of cave-dwelling primitives who are terrified of strangers. The travellers discover that the planet's population is divided into two castes, and that the professed idyll of the Elders - who inhabit a technologically advanced city - seems oddly dependent upon the unsophisticated Savages. Whilst the Elders' leader, Jano, welcomes the Doctor into their society, Dodo stumbles upon a dark secret at the heart of the community. The truth behind the Elders' great knowledge is eventually revealed, and the Doctor sees it as his duty to end a terrible case of exploitation. 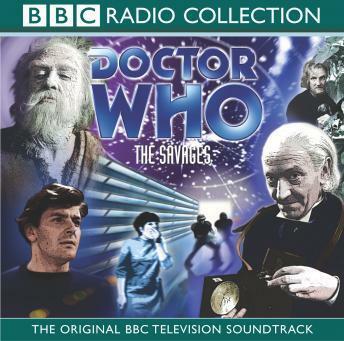 Yet Jano has plans of his own for the Doctor... With the Doctor's faithful companion Stven discovering that events on this planet will irrevocably shape his destiny, The Savages marks the final appearance in the programme of Peter Purves, who also provides the linking narration for this release.